Payday lenders and title loan companies are Sharks. You must train your brain that every time you drive by one of these lenders or see one of their commercials to hear the Jaws theme. They are predators and they prey on people who are afraid they can’t make it to next pay day. Let me ask you this, do you think these lenders are in rich or well-to-do neighborhoods? No, of course not. But you drive through a struggling neighborhood or near a military base, and you will see one just about on every block. And once you borrow from one of them do not expect to pay off your loan. You will keep paying interest on it indefinitely. This is how they make money. It is called predatory lending and that is why in many states, pay day lenders have been shut down by the law. These same pay day lenders are now making loans on titles to vehicles and it is the same trap. Let’s say you own a vehicle that is worth $5,000.00. The title lender will loan you $3,000.00 and place a lien on your vehicle and charge you interest every month. Every month, you will pay them, for example, $300.00, of simple interest. None of this monthly amount pays down your balance. You cannot come up with the $3,300.00 to pay it off for next month, so you keep paying $300.00 a month. No matter how you try you can’t get together $3000.00 because something always happens. You intend on paying more next month, but there are some doctor visits or something else happens and so next month you only make the minimum payment. This goes on for a year. At the end of the year, you have paid them $3,600.00. You have paid them what amounts to 120% in interest and you still owe the original $3,000.00. Does this sound smart? Well, it is certainly smart of the title lender. But for you, not so much. As a bright line rule, just DON’T DO IT! The same principle applies to the payday loans. You borrow a sum with the intention of paying it all off the next payday. But the next payday comes and you can’t pay it back, so the payday lender says,” OK, just pay us the interest and we will make a new loan.” Every payday, you pay the interest but the balance of the loan does not go down. Even with a small amount, you will end up paying more than 100% in interest in a very short time. When I am up late at night and the commercials for these sharks come on, one of the things they hook you with is the guilt, “avoid NSF fees”, “avoid the embarrassment of bouncing a check” or some other measure that plays upon your fear. Now, get ready, because I am about to get harsh here. A simple solution to NSF fees is to NOT WRITE CHECKS UNTIL YOU HAVE THE MONEY! Novel idea, I know. But it is the truth. Let me remind you that you are not alone. You are not the first person who has bounced a check. Hopefully, I have earned the right to speak frankly with you because I have been in your shoes. Just about every mistake I discuss in this blog, I have made. We have been there. We know what it is like to have your rent or mortgage due and to not have the money yet. So, we risk it and give the landlord a check hoping they won’t deposit it until tomorrow and that it won’t clear for 2 days and by then your deposit will go through. But WHOOPS! It deposits in 24 hours and now you have to have an uncomfortable conversation with your landlord. So, next month when you are back in the same boat, you go get a payday loan or title loan so that you can avoid that whole scenario. The problem is that you have now gotten suckered into something you cannot get out of and it’s going to cost you a ton of money you can’t afford. So just don’t do it, no matter how tempting it is. Instead, call your landlord or whoever it may be and explain the situation. Nine times out of ten, if you are honest and simply explain it, they will give you an extension. They may charge you a fee, but it will likely be less than what you would have paid in bounced check fees, that often create a snowball of fees. I have never had someone not work with me, if I simply call them and explain the situation. I once paid over $300.00 in NSF fees because 1 item cleared before I expected it to. Most banks have a policy of paying items largest to smallest. The reasoning, I have been told, is that the higher items are for more important items, like mortgage payments and car payments. The reality is, if they pay largest to smallest, they get more fees because more items will overdraft. That’s the real truth. Banks are in business to make money, period. And NSF and overdraft fees are expensive, often $25 to $35 per item. In 2009 the Huffington Post reported that banks make 38 billion, that’s right Billion with a capital “B”, in overdraft fees per year! They also reported that was double what they made in the year 2000. Overdraft fees are income for banks, plain and simple. Have you heard the fable about the scorpion and the frog? A scorpion asks a frog to carry him across a river. Leary of the scorpion and not wanting to be stung, the frog says, “but you will sting me”. The scorpion assures the frog, “if I stung you, both us will sink and drown”. Feeling better, the frog agrees and begins carrying the scorpion across the river, but midway across the scorpion does indeed sting the frog, dooming them both. 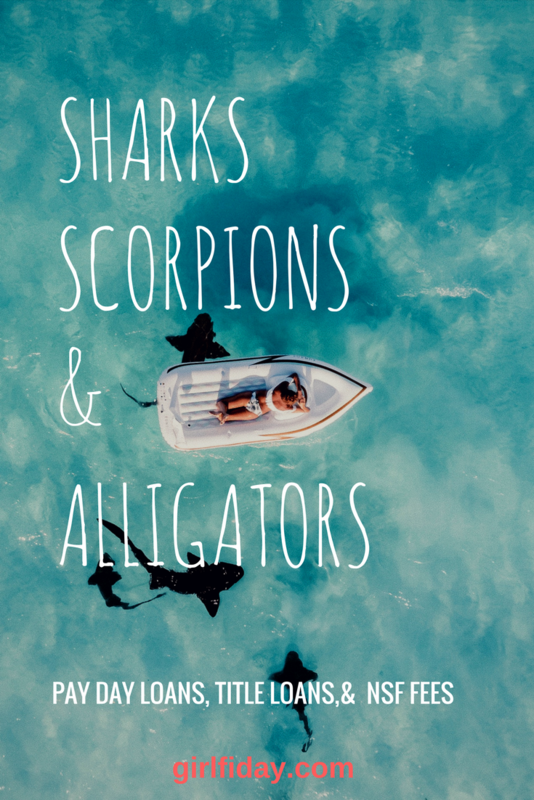 When asked why, the scorpion explains, “what can you expect from a scorpion, it is simply my nature.” I’ve heard this fable told in many versions, sometimes it is an alligator toting a rabbit across and half-way the alligator attempts to eat the rabbit, but the moral is the same. Sharks are sharks. Scorpions are scorpions. The moral of this story for you is to beware of sharks. Like the scorpion or the alligator, sharks will always be sharks and they will always do what is in their nature. Your goal is to survive. And in this journey to be debt free, your efforts in doing so will be much easier if you stay out of shark infested waters. And if you need a life preserver, I am here to help. How can I help? House of FI Podcast COMING SOON!